Sending and receiving mail in Peru is a fairly straightforward process. The Peruvian national postal service -- Serpost -- is reasonably efficient but surprisingly expensive. You can also find international couriers, such as Federal Express, in Lima and some other major cities, but expect to pay even more. If you want to send mail from Peru, the simplest option is to go to your nearest Serpost office. If you want to send a postcard or letter (1 g to 20 g) from Peru to the USA or Europe, expect to pay from US$2.70 to $3.00 (S/.8 to S/.10 soles). Prices rise rapidly with added weight, with the classification changing from “small package” to “package” once you pass 2000 g (at which point you’ll probably be paying in excess of US$40). You can find a full list of prices at the Serpost website. The international tariffs are divided into first and second-class correspondence (postcards/letters/small packages) and first and second-class packages ( encomiendas). You can pay more for added security (see the section about reliability below). Postcards and letters should take about 15 days to reach most international destinations, while second-class parcels may take 30 days. It’s certainly not an exact science, however, so be prepared for delays. Items sent from Lima will normally arrive faster than items posted from smaller towns and cities in the provinces. 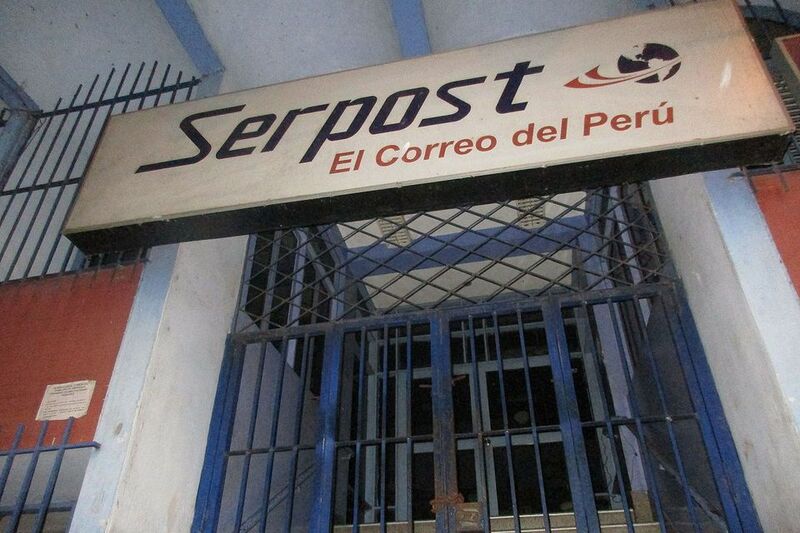 Serpost will deliver letters and small packages directly to your address in Peru. Many larger parcels are held at the nearest Serpost office due to customs issues; you will receive a notification, after which you must go to the office to collect your parcel. Don’t be surprised if you have to empty out the contents of your package in front of a customs official. As long as the contents are deemed to be of less than US$100 in value, you shouldn’t have to pay any additional fees. If the Serpost official thinks that your package contains more than $100 worth of items, prepare for some hefty duties. This can be a real pain, so think carefully before sending anything to someone in Peru -- they might end up paying a lot of money just to take the package home. If you send a camera or a laptop to Peru, for example, you could end up paying the equivalent of the item's original cost just to cover the duties. The letter or package will be delivered to the main post office in the desired town or city. You will need to show your passport in order to collect your mail; the name on the letter or package must match the name on your passport. Depending on the efficiency of the local post office, you might have to wait while a staff member rummages around for your mail. Letters and packages can and do go missing, but the Peruvian postal system is generally reliable. In my experience, the success rate is probably about 95% -- and that’s sending and receiving from the jungle city of Tarapoto (and without using a Peruvian postal code). One potential problem is the disappearance of items from packages. While the package itself may arrive on time, it may soon become apparent that a light-fingered postal worker has, at some stage, opened your package and pocketed some of the contents. If you want to send valuable items from Peru, it may be worth paying extra to have your package sent as registered mail (registrado or certificado). The same applies if someone is sending something valuable to you in Peru.